Your horse should be prepared for the massage therapy session (readily available, brushed, hoofs picked out). Someone should be available to turn the horse back out or walked after the session. Please leave instructions to redress the horse, if blankets, sheets or fly masks are needed. Please provide 24-hour notice if you need to reschedule/cancel a massage session. Payment via cash or check will be due upon date of session/service. If there are contraindications of bodywork/massage, please check with your veterinarian before choosing any therapy. Infections/contagious diseases, hives, ring worm, severe colic and swelling in the heart area are examples of contraindications. 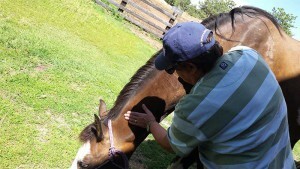 All equine massage sessions are held at your barn and generally last approximately two hours. Please go to this page and fill out the client form prior to your first session.